Dallas, Tex., Oct. 19 – The Los Angeles Times and AP are reporting that the LAPD issued a search warrant in attempt to take possession of the Boyd/Watson tapes. The Los Angeles Police Department disclosed Thursday that it has open investigations on a dozen unsolved homicides that occurred near places where the Manson family operated during its slew of murders four decades ago. The Police Department made the revelation amid a legal battle to obtain hours of audio tapes recorded in 1969 between Charles Manson follower Charles “Tex” Watson and his attorney. The LAPD has said detectives believe tapes could shed more light on the activities of Manson’s group. 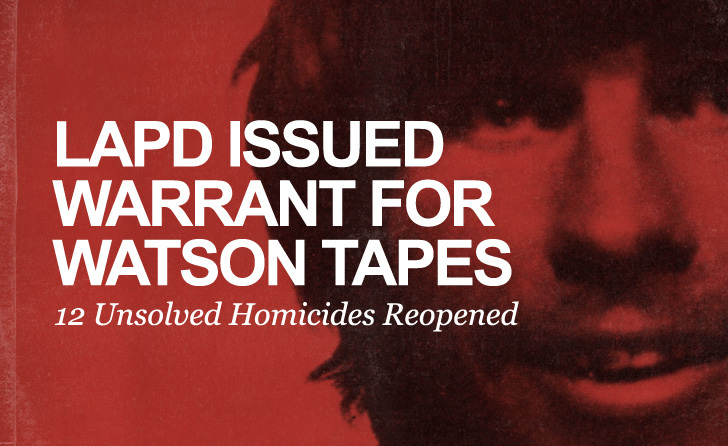 Watson has been fighting to limit the LAPD’s access to the tapes. This month, a federal judge in Texas granted an emergency order preventing the police from executing a search warrant at an office where the tapes are kept. I am quite concerned about the known members and associates of the Manson family. I’ve heard there could be as many as 34 murders attributed to Manson and his followers. One of his followers was Deidre Angela Shaw, daughter of actress Angela Lansbury. Both of Angela’s children were involved with hard drugs, and 15-year-old Deidre was involved with the Manson Family in 1968-69. A mysterious fire in 1970 destroyed the Lansbury’s home in Malibu, CA which prompted a move to Country Cork, Ireland. Deidre received a liver transplant in 1998. Another member, Bruce Davis drifted in and out of California from 1962. There are 3 unsolved murders in Gaviota and Lompoc, California in May and June 1963 that could be attributed to Bruce Davis. The murders of Vern Smith, Bobbie Domingos and Linda Edwards in Santa Barbara County have never been solved. There is the Santa Barbara connection to Manson, Davis and Beausoleil. Manson was arrested with a California drivers license listing his address in Santa Barbara. There are many unsolved murders in Santa Barbara and Ventura County, California from 1963 to 1969. Thank you for keeping us informed about the Manson family.